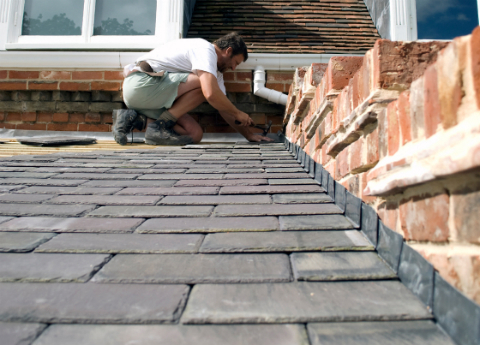 Rubber roofing is one of the best choices for a DIY installation. It is much easier to perform a rubber roof installation than either asphalt or slate, and far safer than modified bitumen. Rubber roofing is usually composed of recycled materials, making it a more eco-friendly choice than most. Although it is more expensive than asphalt roofing, it is much longer lasting. Ensure you have a clear, calm day before attempting your rubber roof installation. Strip your roof down to the decking. Make sure it is clean and clear of all debris. Take your time with this, as any small defect or piece of junk can end up tearing your rubber roof. Then measure out and cut any necessary spaces for chimneys or vents into your rubber roof roll. Sweep again right before applying the adhesive to your roof decking, and then carefully roll out the rubber roof. Remove all old roofing materials and ensure you have a clean roof deck when installing a rubber roof. Hammer in any nails that may be sticking up, or remove them. Fix any loose boards. Then, install the ice and water shield. Simply roll it onto one side of your roof, and nail it in place on the outer edges. Install tar paper overtop, covering the entire roof. Use a staple gun to adhere it to the roof decking at regular intervals. Begin installing the rubber roof shingles with nails, beginning with the starter strip (the strip on the lower edges of your roof.) In straight rows, overlap the shingles until you reach the peak of your roof. Then install the rubber roof cap shingles. If necessary, you can easily cut and form shingles to fit your particular roof. Finally, install the flashing on any joints or seams on your roof. Despite the relative ease of installing a rubber roof, it is worth considering hiring a qualified roofer for the job. This way, you can be sure you are meeting local building codes and fulfilling warranty requirements. All roofing, including rubber roof installation, is a dangerous job. A qualified roofer will have the proper safety equipment and health insurance in case anything goes awry.